Was Ina Drew a Hedger or a Speculator? 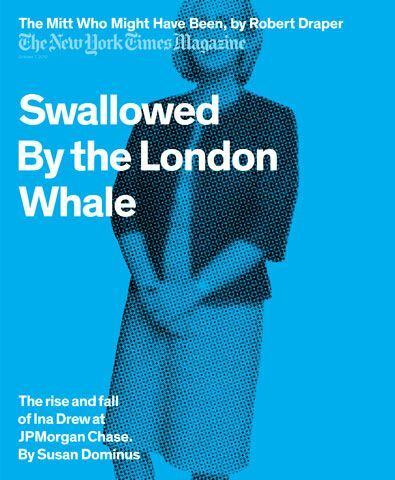 This Sunday’s New York Times Magazine included a piece by Susan Dominus about Ina Drew, the former Chief Investment Officer (CIO) at JP Morgan who resigned following the outsized trading loss in her unit. The focus of the piece is on the rough and tumble of a woman trying “to succeed as an interloper in the Wall Street boys’ club. But buried within the piece is a repeated confusion of hedging with proprietary trading. Dominus repeatedly describes Drew as responsible for hedging this or that risk facing the bank, but immediately afterwards Dominus lauds Drew’s uncanny ability to predict where the market was heading and so to be a profit center. Since the question of whether JP Morgan’s CIO was or was not hedging is at the heart of the public policy dispute surrounding JP Morgan and the Volcker Rule (see here and here), it is worthwhile addressing the confusion in Dominus’ piece. In yesterday’s post I said that Chesapeake’s management was speculating on natural gas and oil prices. But Chesapeake claims that it is a hedger. Speculating and hedging are different things, so is Chesapeake a hedger or a speculator? In representations to regulators, Chesapeake’s Vice President for Finance and Assistant Treasurer, Elliot Chambers, has stated categorically that “we never speculate.” Is that true? Is his definition of a speculator the same as mine? But Chesapeake is also a speculator. The company is straightforward in its SEC filings that it tries to profit off of price swings: “We intend to use this volatility to our benefit by taking advantage of prices when they reach levels that management believes are either unsustainable for the long term or provide unusually high rates of return on our invested capital.” (10K for FY2011 p. 6) “Depending on changes in natural gas and oil futures markets and management’s view of underlying natural gas and oil supply and demand trends, we may increase or decrease our current derivative positions.” (10K for FY2011 p. 59) “Our general strategy for attempting to mitigate exposure to adverse natural gas and oil price changes is to hedge into strengthening natural gas and oil futures markets when prices allow us to generate higher cash margins and when we view prices to be in the upper range of our predicted future price range. Information we consider in forming an opinion about future prices includes general economic conditions, industrial output levels and expectations, producer breakeven cost structures, liquefied natural gas trends, natural gas and oil storage inventory levels, industry decline rates for base production and weather trends.” (10K for FY2011 p. 87) As I related in yesterday’s post, Chesapeake’s decision last fall to remove its natural gas hedge was based on its prediction that prices were temporarily low and would recover, allowing it to replace the hedges and capturing a profit on the short-run volatility. This is all speculation. A company can be both a hedger and a speculator. In the world of finance, the name Metallgesellschaft (MG) is known primarily as one of the early “derivative disaster” cases. MG was a metal, mining and engineering company, and the 14th largest corporation in Germany. At the start of 1994, the company stood on the brink of bankruptcy because of more than $1 billion in losses racked up by a small trading office in New York with a big bet in oil futures. MG’s debacle sparked a vigorous debate—our contribution is here, and a collection of many contributions is available here. MG was short on a set of long term contracts for the delivery of refined oil products to small businesses for periods of up to 10 years. Many of the contracts were negotiated with a fixed price, while others had more complicated terms. On the other side, MG was long a set of crude oil futures or OTC swap contracts for delivery in one to six months. Taken together, this looked like a long dated short position in the physical hedged by a short dated stack of futures. The critique focused on two questions. First, was the short dated stack a successful value hedge, or had traders at MG failed to accurately “tail the hedge”? Second, did the attempt to hedge such a long horizon physical obligation using derivatives subject the firm to one-sided margin calls, producing a liquidity crisis that the firm could not withstand? From these two questions flow a host of related questions about alternative designs of a better hedge, about the accuracy with which the accounting reflected the underlying financial reality, and governance. From the narrow perspective of financial engineering, these are all useful questions to consider. However, these questions all start from the premise that the task is to hedge the company’s given exposure on the physical contracts. That is what the situation looked like at first glance, from outside. But courtesy of the acrimony between the team that crafted the failed futures trading strategy and the corporation that dismissed them, a number of internal documents with details on the strategy became public. Those documents reveal that this premise was incorrect. The traders at MG operated under a very different premise: the long futures position was the real source of profit. If it had been up to them, they would have concentrated on building it up. However, corporate risk management rules limited the quantity of long futures contracts to the volume of physical deliveries. The traders, therefore, had an incentive to market the physical delivery contracts. The more they expanded their long positions in the futures contracts, the more they could loosen the limits imposed by the internal risk limitations, and expand speculative trades. The long futures position only looked like a hedge. In fact, it was a speculation. Traders used hedging to engage in risk taking.This was a classic prop trade disguised as a hedge of a customer facing transaction. When the prop trade blew up, it nearly brought down the entire firm. This aspect of the case is often forgotten. Eighteen years later, this lesson from the MG case has renewed relevance in light of the $2 billion trading loss by trader Kweku Abdoli at the Delta One desk of the Swiss bank UBS. That spectacular loss gave a fresh reminder of the dangers posed by prop trading at banks, and of the need for prohibitions like the Volcker Rule. So long as taxpayers are the backstop for banks, the traders, the management and shareholders do not suffer the full penalty of the risks from trading. Opposition to the Volcker Rule by bankers is strong, and takes many forms. They argue that any customer facing business, like a Delta One desk, is protected from the prohibition by the mere fact that it is customer facing. This is nonsense. Thankfully, the current draft regulations for the Volcker Rule look to all of the fingerprints of prop trading, and do not provide any such simplistic exceptions. Both the MG case and the UBS case show that prop trading can operate under various guises. It’s prop trading that is the problem, regardless of how it is cloaked.